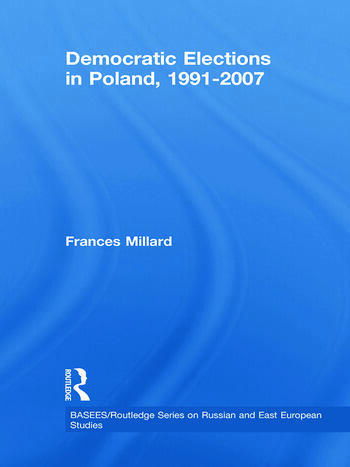 This book is a political history of democratic elections in Poland from the first fully competitive parliamentary elections in 1991 to the unexpected, most recent election in 2007. Until now, there has been no equivalent study covering similar developments in this, or any other, post-communist country; this book fills the gap and provides a detailed electoral perspective on the trajectory of political development in the context of post-authoritarian change. It also provides an invaluable account of the evolution of electoral processes and institution-building in the context of democratic regime development. The major themes of the book centre on the complex, problematic development of Poland’s political parties and the parties’ failure to gain public support and win the confidence of the electorate. Frances Millard examines the failure of Polish elites; the lack of a stable party system and how elections have had a destabilizing effect, and she argues that the interaction of leadership volatility, party volatility, and electoral volatility have created uncertainty and undermined political parties as effective vehicles of representation. Poland is a large and important country, worthy of study in its own right, but equally many of the problems experienced are not unique to Poland; so this book also constitutes a comparative benchmark for analysis of democratic developments elsewhere. Frances Millard is Professor in the Department of Government at the University of Essex. Widely regarded as an expert in the political and social developments of post-communist states, her book, Elections, Parties and Representation, won the George Blazyca Prize of the British Association of Slavonic and East European Studies in 2007.